Skopje By the Sea, Florida. I haven't been posting this week, because I was down in the Republic of Macedonia, as pictured above. No, not that Macedonia. The other one, the newer version, Macedonia 4.0, with new features such as palm trees, Cuban sandwiches, and rum mojitos. Macedonia as it was intended to be - located in southern Florida - far away from Greek territorial claims and annoying Albanian irredentists. 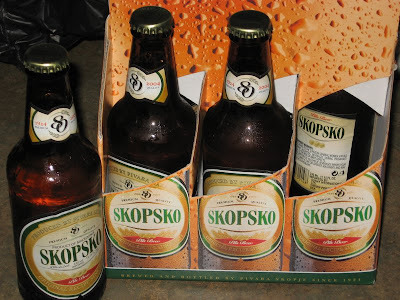 Of course, this new Macedonia 4.0 offers many of the better features we associate with the older models, such as Skopsko Pivo, now available in the gas stations of Boca Raton. 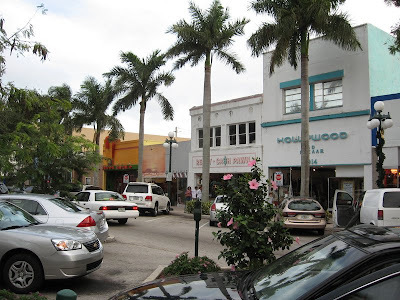 Boca Raton - yes, the name of the town translates as Rat's Mouth - is located just north of Fort Lauderdale, and has been home to my old buddy Emil for over a decade. 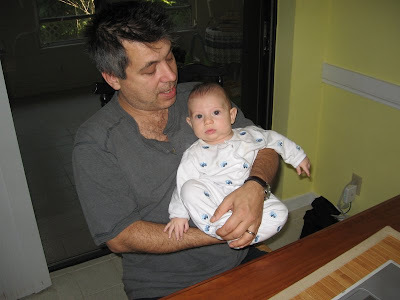 Emil is a Macedonian who came to the US back in the seventies, when we met the night I bought my first Macedonian bagpipe, a goat skin gaida. I was chatting at a classic 1978 Ramones/Pattie Smith/Clash punk house party with this hippie guy that I took to be Mexican, when the topic of bagpipes came up. This Mexican guy also claimed to play the gaida as well as the kaval, the Macedonian long flute. Unique for a Mexican, but Emil turned out to be Macedonian, and we've been friends - and partners in many of the wierdest experiences of our lives - ever since. 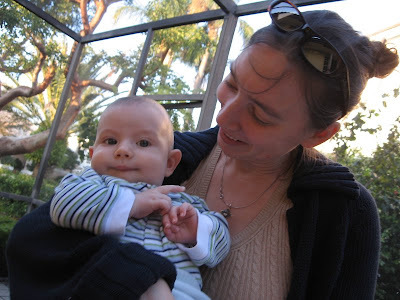 Recently, Emil has taken on a new and even more dangerous project: Emil and his wife Jen are attempting to breed miniature Macedonians in the Florida swamps These miniature Macedonians have all the outward appearances of regular Earthlings - they smile a lot, they fart a lot, and they get hungry at odd hours of the night. They look cute and innocent, but I warn you, citizens of Earth... meet your new Master! Mansur. He will inherit the leadership of the Guffi'yah tarikat ... the legendary Brotherhood of the Goofy Sufis... Just south of Boca and Ft. Lauderdale is Hollywood, Florida. Hollywood seems to be the magnet community for emigre Balkanoids. This is what the Balkans were supposed to look like before the planning commitee went all pear-shaped. 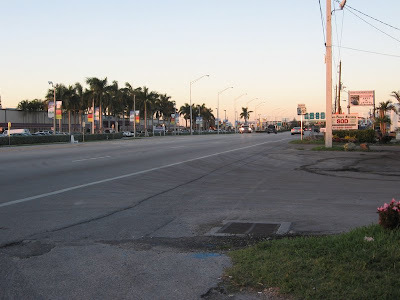 It is possible that the attraction was the fact that these south Florida towns offer the only decent espresso coffee in the continental United States, due to the influence of the Cubans, who laugh at your puny Starbucks and its ridiculous caffeine content. 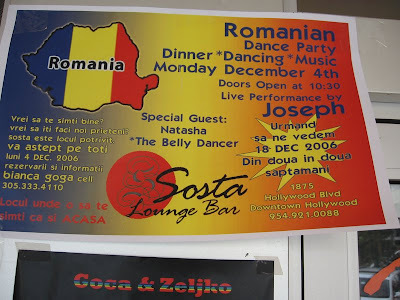 You can hear Serbian, Macedonian, and Romanian spoken in the local cafes of Hollywood. There is a Cafe Transylvania off the main drag and you can buy Romanian style cheese and salami at the market. I felt right at home... walking around in a t-shirt and flip-flop sandals in the humid heat on Christmas day. Just like Craicun in Cluj! Of course, some of the traditional culture of the Balkans gets lost when transported to south Florida. The traditional sour soup of the Balkans, ciorba, begins to look suspiciously like Vietnamese pho, especially after you squeeze lime into it. 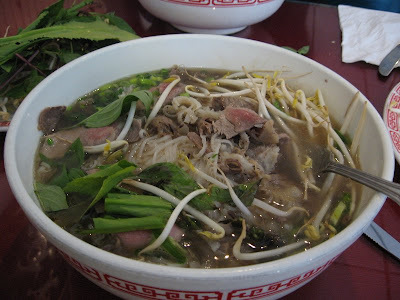 Actually, on Christmas day, Vietnamese restaurants were the only places open. Perhaps the best soup on earth. South Florida is essentially a swamp. 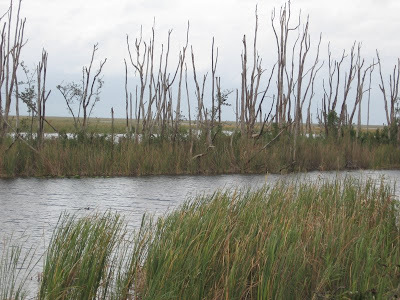 The Everglades swamp comes right up to the edge of the central Florida towns, and alligators suddenly become a very real problem to people who jog along the canal with their poodles. 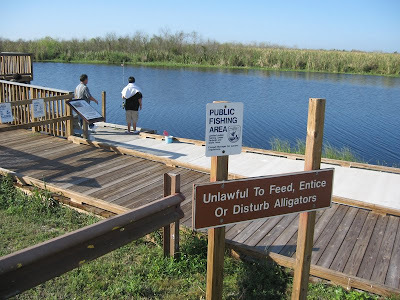 The sign informs us it is not wise to "entice" alligators. Poodles are the preferred snack for "enticing" two meter long alligators. I actually saw a gator raise its huge head while fishing in a canal for peacock bass. It was like watching a queen-sized bed emerge from the creek to laugh at me. The peacocks are an amazonian predator fish introduced to control the populations of exotic tropical fish that Floridonians have released into their native waters - cute fighting siamese guppies grow to three meters in these waters, and they like poodle meat as well. Tilapia breed like rabbits in the canals. Air-breating catfish stroll around parking lots at night. 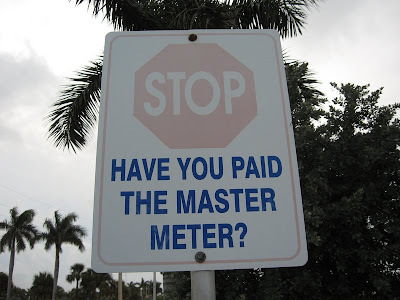 Simply speaking, south Florida is an environmental nightmare. You might think Florida would have been better off if left to the stewardship of its native people, the Seminole Indians. Maybe. The Seminole have a reservation in Hollywood as well. Here is the view from the main street on the Dania Seminole Reservation. Hmmmm... well, at least the tax-free cigarettes were cheap. Long live Native Sovereignity! 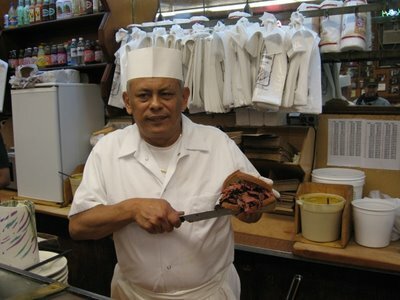 If New York has one single unique food experience it would have to be the New York Delicatessen. 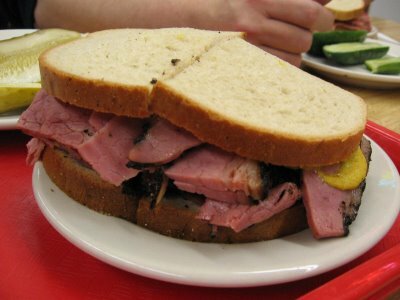 Real, old fashioned deli food is fast going down the same road as the dinosaurs as people defect to fast food places or more upscale trendy restaurants, and even in New York itself it has become hard to find an honest corned beef sandwich or pastrami on rye worthy of the name. And so we are back to Katz’s. 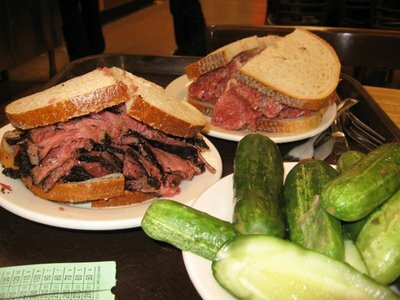 Katz’s is the original, the Ur-deli, the navel of a world sliced from steaming pastrami. Katz’s is the last dinosaur standing on the block. Sure, there are other delicatessens in the New York area, sure, it isn’t really the last, but with the closing of the Second Avenue Deli last year, there aren’t too many other places with as much history serving cured meats on rye bread around anymore. The Carnegie Deli serves a pricier uptown crowd, as does Pastrami King, but these upper Manhattan delis are sort of a Walt Disney’s Deli World of nostalgia: pay your twenty dollars, stand in line, and imagine that you are on the lower east side again. 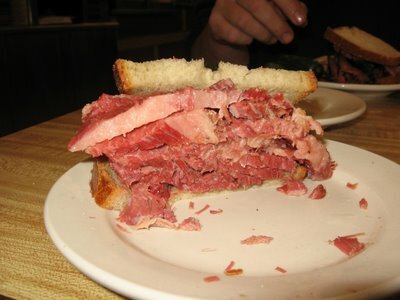 In Teaneck, where my parents live, there are dozens of more-kosher-than-thou delicatessens to the square mile, and none of them serve a decent corned beef sandwich. 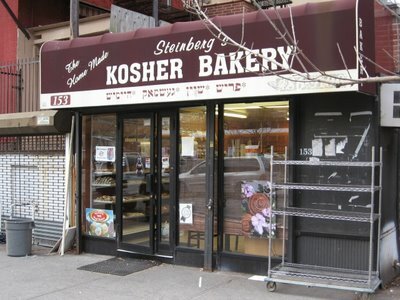 When the only legit competition is in Montreal, then the only response is to go to the source: Katz’s Deli, Houston Street, in the old Bowery section of the lower east side. 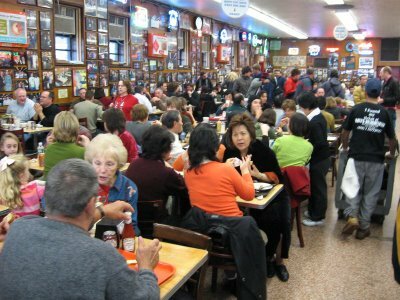 Everything about Katz’s is unique – including the method of ordering and paying. You take a ticket, have the counterman mark your ticket, and they don’t let you out until you surrender that ticket. 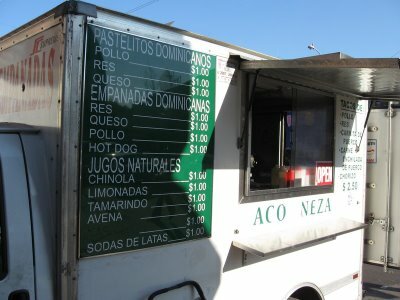 You order from one of the countermen – guys who are invariably from the Dominican Republic, although Mexicans are now filtering in. Previously the lineage included Russian Jews, Puerto Ricans, and Jamaicans. 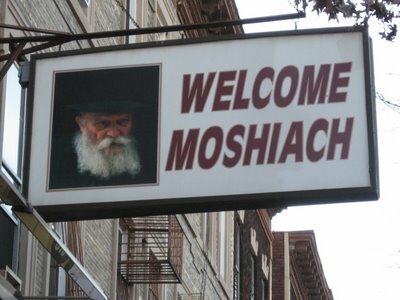 These guys are the inheritors of an Ashkenazic Jewish eating style that goes back four generations to the days when the neighborhood was predominantly Jewish, before the lower East Side became “Loisada.” Today the area is fast becoming some of the most sought-after real estate in NY City. 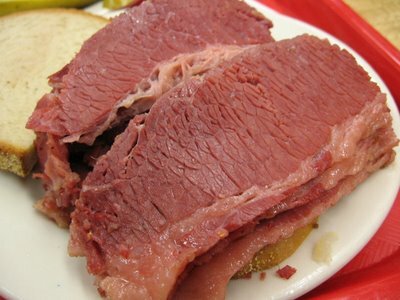 We discussed the history of pastrami a few months ago, but this is New York pastrami and corned beef, what the British call salt beef and the Canadians know as “smoked meat.” Corned beef is a beef belly cut that is cured in salted brine and spices. Taking a corned beef, covering it in black pepper and coriander and smoking it produces pastrami. Both are then steam cooked. 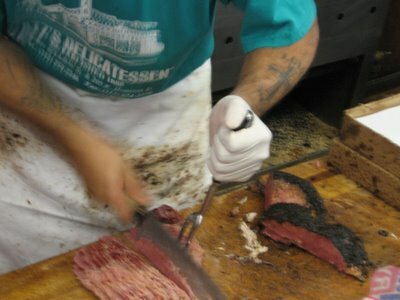 At Katz’s, the counterman asks if you want you meat “lean or juicy.” You want it juicy, which is to say, fat. Counterman then slices a bit off, sets it on a plate and offers you a taste. It’s like sniffing the cork of a fine wine, only involving meat. Corned beef is served on rye bread. This is the canon law of New York. In the film Annie Hall there is a scene where Woody Allen takes Annie to a deli, and she orders corned beef on white bread with lettuce and mayonnaise. If you laugh at this scene it indicates that you are a true-born New Yorker. 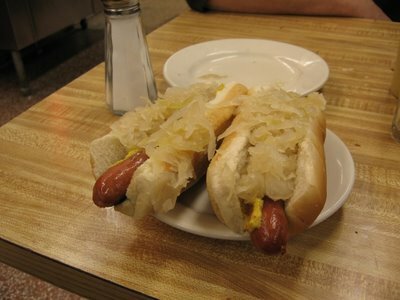 Katz’s is also home to some of New York’s best hot dogs. These are the same Sabrett’s hot dogs that street vendors sell, but at Katz’s the frankfurters are grilled, and you can ask for a “burned dog” with an extra crispy skin. Next to the dogs are knishes. Knishes were what New York ate before there was fast food. Hot dogs are nice, but knishes fill you up. Spiced potato and onions are wrapped in heavy pastry dough and baked, then grilled. Eat them straight or cut open and filled with mustard. 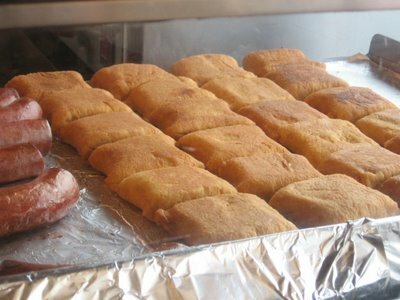 You can still get knishes for a buck at many delis and hot dog stands around the city – a valuable tool to fending off hunger on a budget. Down the street is Yonah Shimmel’s Knishery – a 100 year old Knish joint that has started to add Israeli style vegetable knishes and other “healthy” items to the menu. Sad. 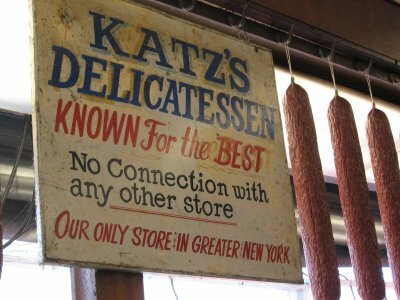 Both Katz’s and Yonah Shimmel are typical New York “Kosher Style” delis – not strictly kosher, but not serving meat and milk mixed or pork products. 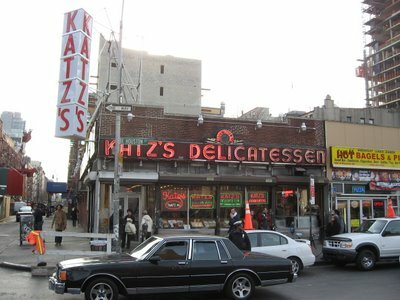 Modern Orthodox Jews accustomed to “Glatt Kosher” restaurants hate places like Katz’s – they look attractively Jewish, but the food is not certified kosher. 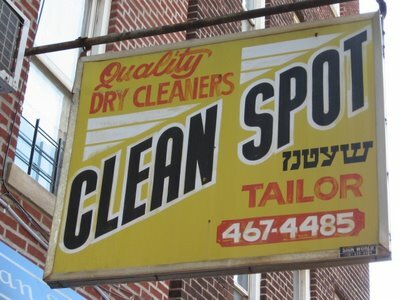 The service is old style Jewish – rude, loud, they serve tea in a glass, and the sodas include the old fashioned Dr. Brown’s Cel-Ray, which is celery flavored soda. 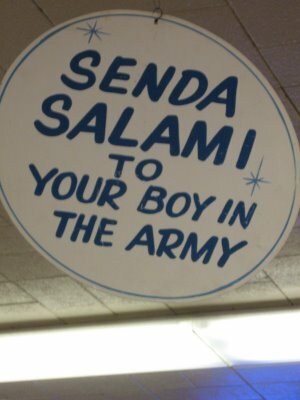 During World War Two Katz’s had the idea of mailing New York salamis to the troops stationed around the world. The idea stuck, and now Katz’s does a pretty booming mail order and catering business. The amount of meat served in a single meal at Katz's Deli is enough to serve a family at home, but it is so juicy and tender that it goes down well, finding some creative way to fit into the alimentary canal. I usually start out with the Hot Dog course, freshen the palate with a few half sour pickles, and then move on to the corned beef or pastrami course. No, I could not eat at Katz's every day. Maybe every week. You don't need a posh table and a snobby waiter to know you are getting the best the world has to offer. Katz's is authentic. Katz's never sold out. Katz's is the real thing. Ft. Washington: Bienvenidos a la Republica Dominicana! Walking around the Fort Washington neighborhood in northern Manhattan is one of my favorite time wasting activities. 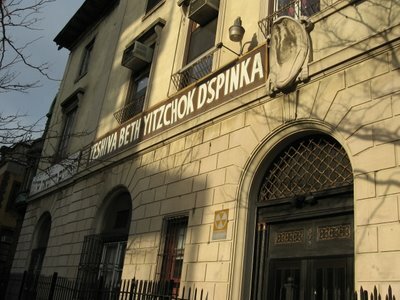 This is the home of both the city's older German Jewish community as well as the location of the Dominican Republic. 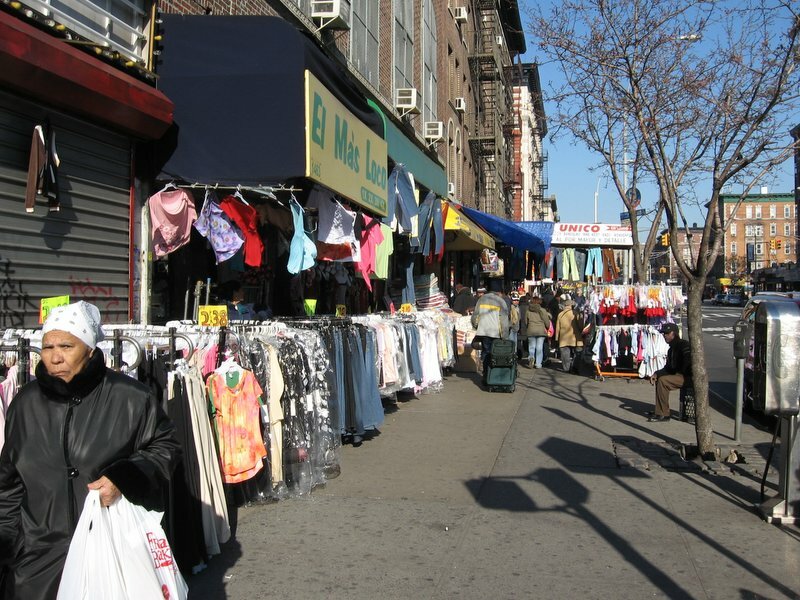 Many of you may think that the Dominican Republic is located on an island in the Caribbean, but you are wrong, it is located at 181st St. and Broadway in New York. It is also one of the great eating and walking nabes of the city. Like all Hispanic neighborhoods in New York, one finds the local botanicos everywhere, which serve the various Afro-Caribbean religions such as Santeria, which is based on the Yoruba religion brought to the new world by slaves. 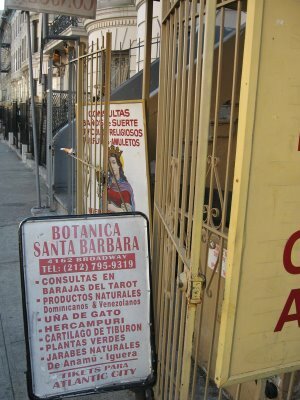 In Santeria, Santa Barbara is the Catholic "mask" which cloaks the identity of Shango, the Thunder God of the Orisha pantheon. 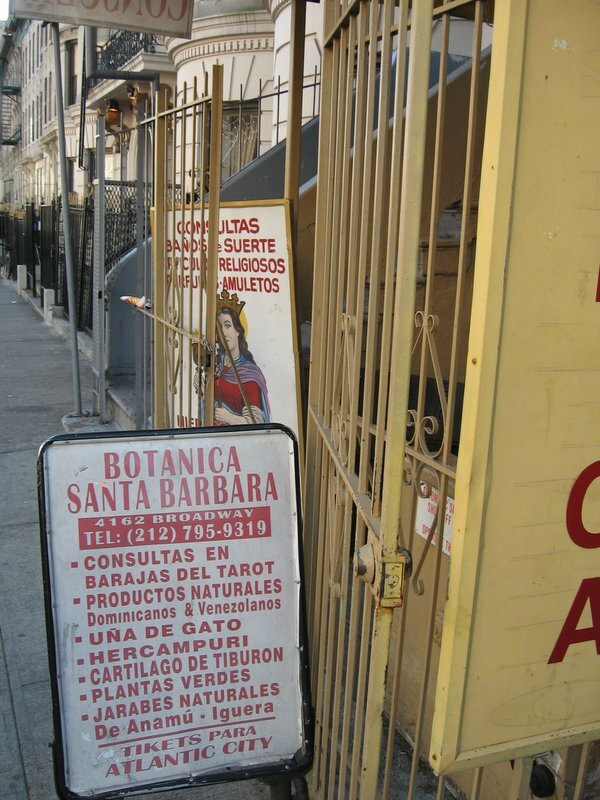 Among other services offered here are tarot readings, shark cartilage, and herbs necessary to the Santeria ceremonies. But where else does Shango offer tickets to Atlantic City? New York is famous for the high costs of eating out. Perhaps this is an undeserved reputation. 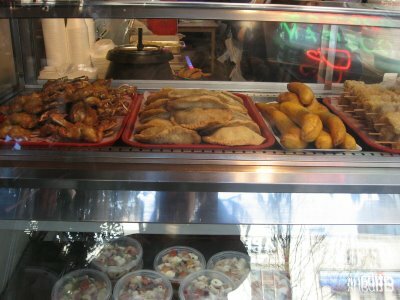 Everything on the menu here - filled pastries and fried meat cakes - is one dollar. These are the offerings at one of Fumie's favorite New York eating spots, the Fish Market behind the George Washington Bridge terminal. 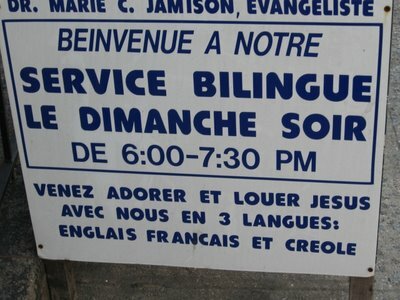 Typical of Dominican places, everything is offered - maybe you didn't want fish? Maybe you wanted chicken? Fried plaintains? No problem - we got it all, primo! 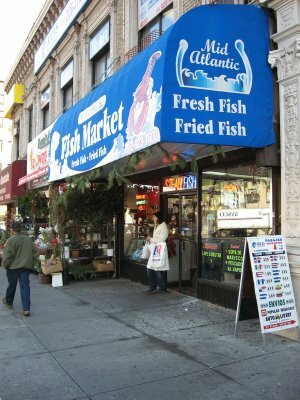 The first time I took Fumie here, everybody actually treated us as if we were tourists visiting the Dominican Republic. One guy sitting in a fold-up chair in the corner was munching away at a huge fried grouper fish, of which he offered us a bit. Everybody spoke Spanish with us, since, after all, we were visiting the northern outpost of La Republica Dominicana... And this is the real thing: the seafood soup, sopa de mariscos. One Dollar. 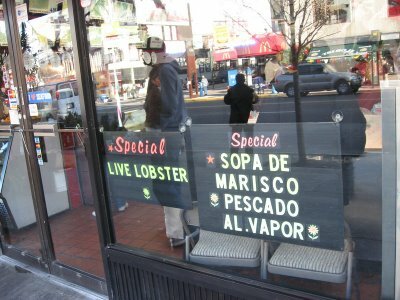 Five years ago Fumie declared it the best fish soup she ever had. I went in for a second opinion today. She was right. It was so good I forgot to snap any pictures. Oh well. It looked like... soup. Not entirely photgenic. But last night, after a klezmer gig at Moto in Williamsburg with Jacob Shulman-Ment and Pete Rushevsky, I did get the following amazing photo of the day. 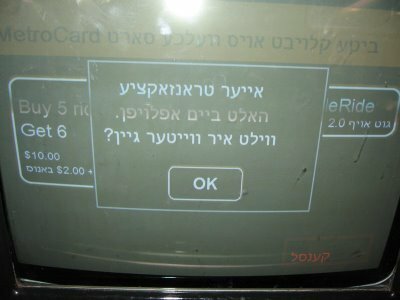 Where else, but in Brooklyn, would one be able to buy a subway ticket in Yiddish? Korean and Japanese Shopping Malls of Jersey. 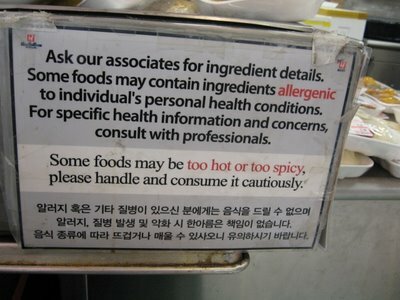 Eat More Kimchee. Eat More Stinky Little Fish. One special perk of being located just outside of New York in the Jersey suburbs are the huge immigrant populations that have always used the Garden State as refuge from the city's insane real estate costs. Just across the Hudson River in Fort Lee and Edgewater are large Korean and Japanese shopping malls. 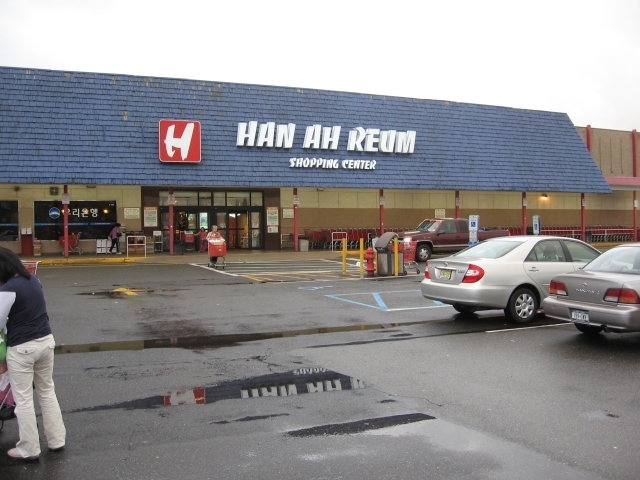 The local spicy rotten cabbage emporium is the Han Ah Reum in Ridgefield, NJ. I consider myself lucky - I actually love Korean food. 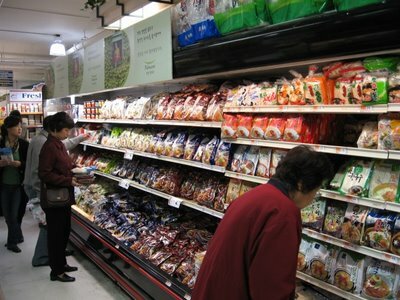 In New Jersey, for some odd reason, no other non-Korean will admit to liking Korean food. Korean food is , admittedly, one of the more out there cuisines on the planet, rating up there with Polar Eskimo and Finnish food for divergence from Western food norms. (Polar Eskimos eat fermented auks and rotten green seal meat. 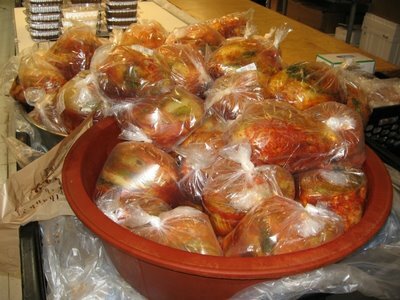 The Finns - using different ingredients - aim to make all their food taste like fermented auks and rotten green seal meat.) The Koreans like bold flavors - very hot, very sour, very beefy, anything as long as it is very. They are not shy eaters. 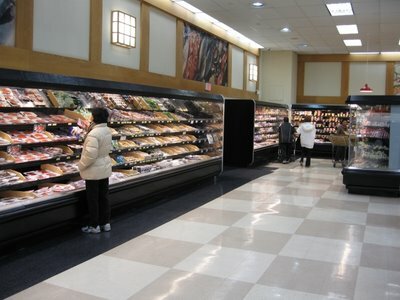 Some of these New Jersey ethnic supermarkets are simply humongous - a celebration of increased spending ability compared to the old country. The Koreans came to the NY area after the fall of the "Asian Bubble" economy in the 1990s, and they have done very well for themselves. If you need your nails painted, or you automobile transmission fixed, Mr. Park and Mr. Kim will be very happy to oblige. Korean food means kimchee. Kimchee are salted and fermented spicy vegetables essential to any Korean meal. Salted cabbage is the classic kimchee. Every culture has a food specific to ... digestive emissions. What bean soup and stuffed cabbage are to eastern Europe, kimchee is to Asian cuisines. If anybody wishes to make fart jokes, please, now is the time. Go ahead. We are talking about kimchee, so we are expecting some fart jokes. Really, we expect such things when kimchee is the topic of the day. Just down the road from the Korean enclave is Edgewater, NJ, home to the Mitsuwa shopping center , a Japanese mall transported to New Jersey that serves the New York Japanese community. The Japanese are more like ex-pats in Europe - here now in body, but not necessarily in spirit. 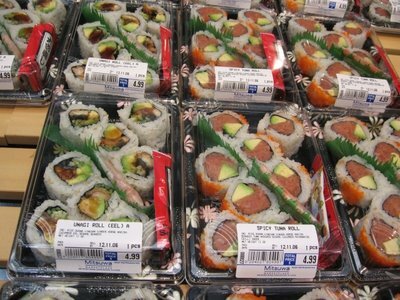 Most Japanese are on company contracts for several years in NewYork, and the Mitsuwa offers them everything from fresh tuna sashimi to Japanese toothepastes and laundry powder. Walking into Mitsuwa is like walking into a transplanted suburb of Tokyo. Friends of ours in Budapest and Transylvania have all heard Fumie's stories about shopping at Mitsuwa. Well, this is where all that wasabi comes from. Since Fumie is in Tokyo right now, I can actually come here and not buy everything to take back to Budapest. 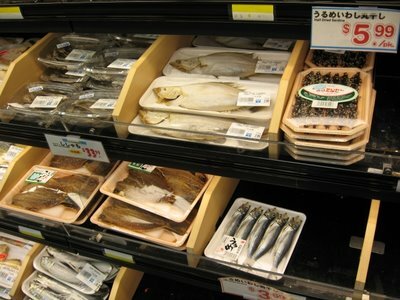 And I can pass on delicacies such as half-dried stinky little fish for TV snacks! Still, anyplace that is Japanese-owned and offering fresh bento boxes of sushi for under five dollars can't be passed up easily. 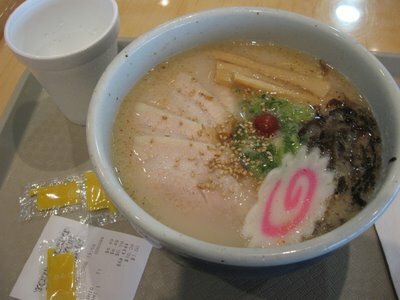 Half of the Mitsuwa Center consists of a food court that includes favorites such as Japanese-style Italian food, a St. Honore Japanese-style french pastry shop, and various stands offering Japanese pancakes, fried katsu (cutlet) dishes and ramen noodle soup. Since I can choose whatever I want (not possible when Fumie is around because she knows far better than I what I want) I went for salt pork ramen soup. Not Kosher. Not at all. Very goooood. 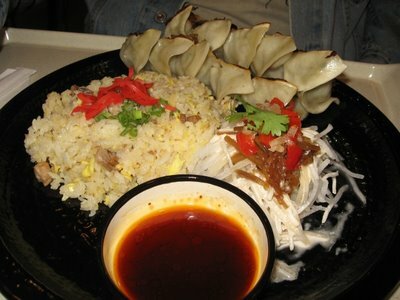 Gyoza, Japanese dumplings. Certain Croatians I know would kill for a plate of these. 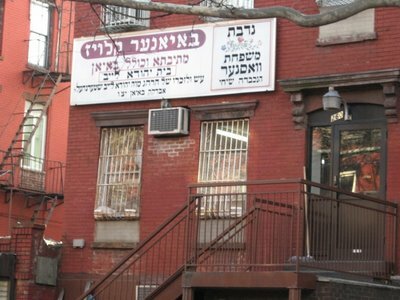 But Fumie makes better gyoza at home using ingredients from the Bosznyak tér market. .
Williamsburg, in North Brooklyn, is the enclave of the most insular of the Orthodox Hasidic Jews - the Satmar hasids. Hasidic Jewish tradition is centered around the person of a Rebbe, who is somthing more than what most people think of when using the term rabbi... A Rebbe is not only learned, he leads of a group of pious Hasidic Jews and usually descended from one of the original followers of Rabbi Israel Ben Eliezer (1698–1760), the Baal Shem Tov (also known as the BeSHT) who founded and inspired Hasidism in the early 18th century in east Europe. 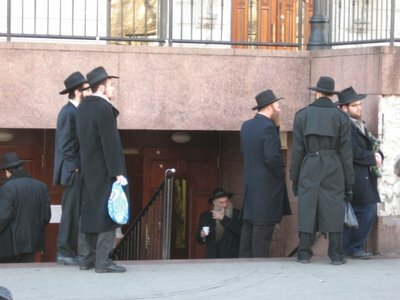 There are many hasidic groups today, all of whom maintain a presence in one of Brooklyn's three main hasidic neighborhoods (Williamsburg, Boro Park, and the predominantly Lubavitch Crown Heights) known as "courts" (hoyfn in Yiddish) and the "Hungarian" hasids are dominated by the hoyf of Satmar. Satmar originates from the court of the Teitelbaum rabbinic dynasty based in Satu Mare, Romania (once part of Hungary and known as Szatmár.) Satmar is what most hasids mean when they talk about "the Hungarians" - pretty much in the same tone of voice that everybody else in east Europe uses when talking about "the Hungarians." They are insular. Argumentative. Impenetrable. Intransigent about language. But they have very good pastries and cakes. 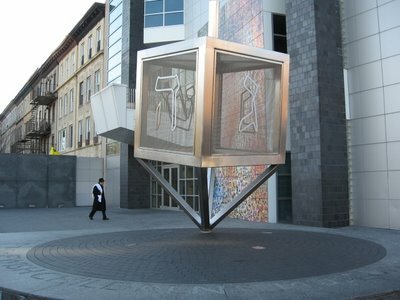 After the destruction of Hungary and Transylvania's Jews during World War Two, the remnants of the Satmar and other hasids moved to New York. Satmar is famous for its opposition to the secular state of Israel, based on the teachings of the Rabbi Itzik Traub of Nagykallo (near Debrecen) known as the "Kalever Rebbe" which define the conditions for the return of the Messiah to earth. 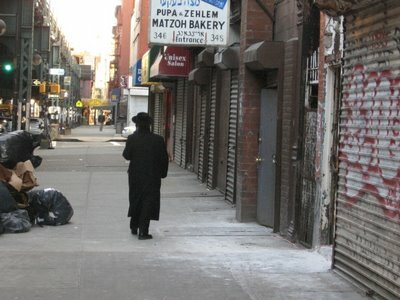 Since Israel was not formed by divine Messianic decree, the existence of the Zionist State isn't considered by Satmar to be legitimate, and the Satmars prefer to reside near their rebbes in Brooklyn, althgough many do travel to and reside in Israel in the Mea Shearim area of Jerusalem and Bnei Brak near Tel Aviv. One faction formed the anti-Zionist organization Neturei Karta, which recently sent a delegation to Iran to meet with President Ahmadinejad of Iran. Drive a car around Williamsburg on a Saturday and you may just have a rock thrown at you. Satmars are serious business. 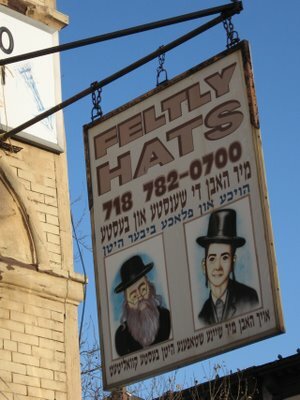 All in all, not your everyday, boring little ethno-religious Brooklyn enclave. In terms of conservatism, Williamsburg is it. 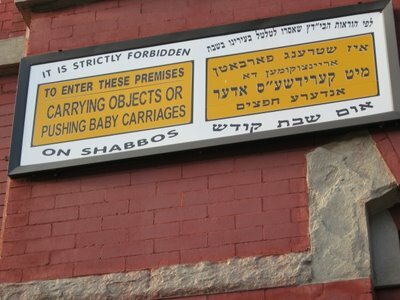 Satmar families are huge - the streets are crowded with baby carriages. There are about 150,000 Satmars in the world today, far more than there were before WWII. The Satmars feel that since Hitler tried to wipe them out, they would rebound with a vengence. Families with eight kids are common. 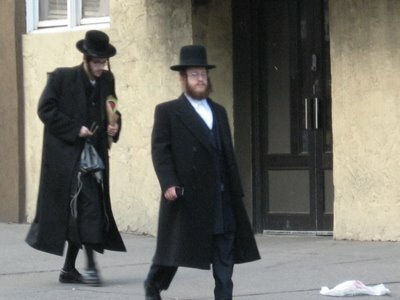 Satmar is about outbreeding the Holocaust - they are the largest of Hasidic sects today. Other Jews may look at them with with distaste or even hatred - for their insularity, for their "backwardness" or for their anti-Zionist views - but I agree with what Michael Alpert said of them: if not for them, we would have almost completely lost our window on east European Jewishness, yiddishkeit, after the Holocaust. They preserve it with a vengence. 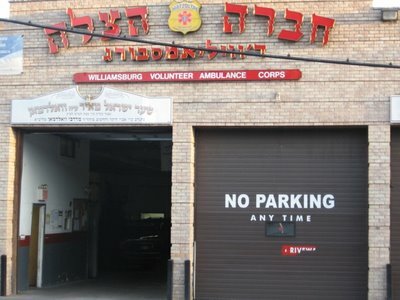 Williamsburg, for example, is the largest concentration of Yiddish speakers in the World today. Need a cab? 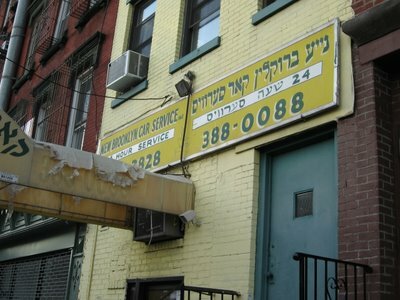 Try the "Nay Brooklyn Car Servis, 24 sho servis" The Satmar schools teach in Yiddish, as Hebrew is considered too holy for everyday communication. 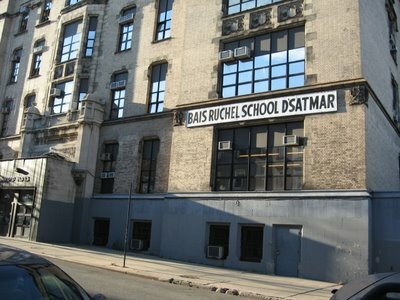 Many of the schools and Yeshivas are the direct organizational descendants of previously existing schools in the old country. 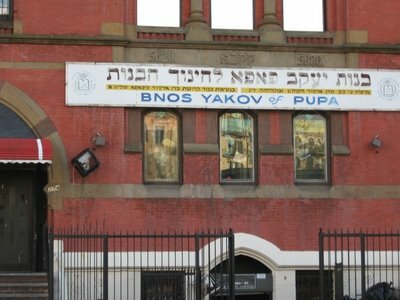 Pupa is the legacy of the Yeshiva in Pápa, a town in the Bakony region of west Hungary. Of course, you couldn't go without some extremely kosher matzoh bread from the Pupa/Pápa traditional bakery on Bedford Avenue. 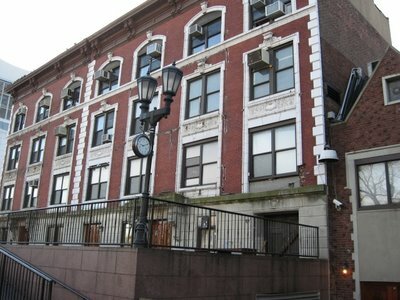 The Satmar Girls School. Pearl Gluck, whose independant film "Divan: The Couch" looks at what it is like to grow up Satmar in Brooklyn, went to such a school in Boro Park. 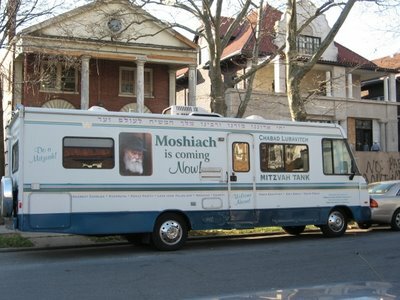 Pearl is modernity's window on Satmar. Check out the film. Some of Di Naye's music is used in it. Săpânţa is a town just in the Marmures region of Romania. Known for its cemetery - a folk art treasure called the "Happy Cemetery" - it was called Shpinka in Yiddish. 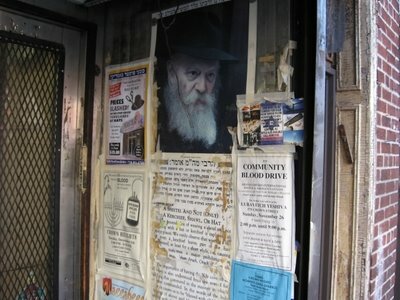 Many of the smaller Hasidic groups maintain small prayer houses - shtibele - such as this, the kloys of the Boyaner Hasidim, who originate in Bukovina. Williamsburg is a pretty self-contained world. You get sick, you want a kosher ambulance service. And ye shall know them by their hats. Different groups of Hasids wear different styles of dress. Satmar are into knickers and flat toped felt hats. The only other place in theworld where one can see this many odd, flat-topped hats is in eastern Marmures on a Sunday. 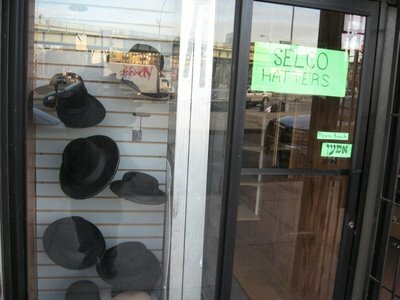 Satmars take their hats very seriously. All hasids do. Lubavitch like fedoras, Bobov like bowlers, non-hasidic Litvaks like gigantic fedoras that would make the Romanian Gaboresti green with envy. And they have to fit perfectly in order to wear a yarmulke underneath. 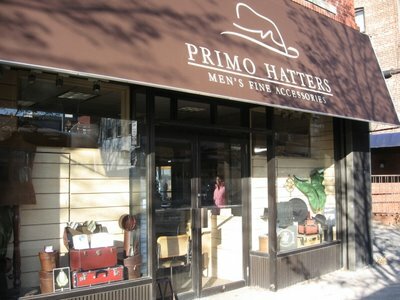 On Saturday - Shabbos - out come the striemels and pelzes, big flat fur hats that are the pride of all hasidic adult men. Williamsburg is also the last place outside of east Europe where men regularly wear kucsma, the furry winter hats. This shop is across the street from the new, hip area of Williamsburg. Rappers Jay-Z and Buster Rhymes have both bought trendy lofts within a couple of blocks of this shop. Wort! Shulem af di velt, oys, y'all. Régi Kincsek: Treasures from my Mother's side. Oytsres: Treasures from my Father's Side. 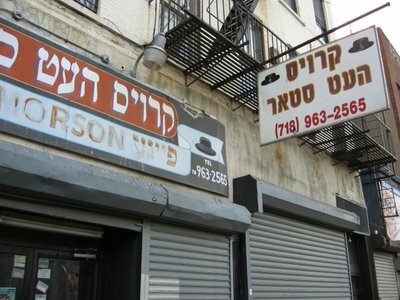 Safe Treyf: Jews and Chinese Food.